A collection of contemporary rugs woven in a mixture of natural shades like beiges and creams. Choose from 28 different designs which include borders, waves, blocks and damask patterns. Colours are mainly different shades of beiges, browns and creams. 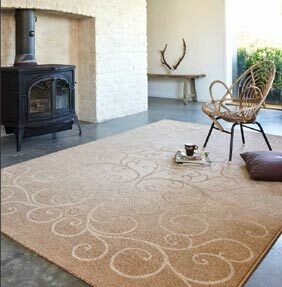 Tivoli rugs are stocked in a large range of popular sizes including large room size rugs up-to 240x340cm. Tivoli rugs are machine woven in Belgium on Wilton weaving machines, the pile is made from 100% polypropylene, this type of construction / pile is extremely dense and hard-wearing. GUT-certificate guarantees environment friendly materials are used and consumer protection against harmful substances.